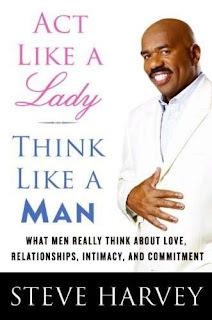 The Fresh Music Page: Steve Harvey 'Act Like A Lady, Think Like A Man' Plagiarized? Steve Harvey 'Act Like A Lady, Think Like A Man' Plagiarized? Actor, comedian , radio show host, and best selling author? Steve Harvey, the funny southern man that most of us tune in to religiously every single morning, may indeed add plagiarist to his list of accomplishments. With a novel that is on the New york Times, best selling list, and not to mention most woman's holy grail, Mr. Harvey might be dishing out some funny money. The book entitled, 'Act like a Lady, Think like a Man', seems to be quite similar to a coequal titled novel written by Chicago author,Sharon P. Carson. While I wouldn't doubt Steve has the ability to write such a novel thus belonging to the male species, the resemblance is a bit too much. Various topics and chapters are alike in each book. To top it off, he and Oprah are discussing a movie! Now shame on him! Hopefully the original author with get the right compensation, and as far as Steve ... 'You bogus Mr.Hightower!' lol .. until next time ... keep it fresh!